It seems like the legend of the mythical Candwich has been floating around the internet forever. Really, it has probably only been about half a year, maybe slightly longer. But when the promise of a truly bizarre food product like a canned sandwich gets announced, any amount of time seems like too long to wait. I was imagining the worst – a sandwich compressed into a sardine can, smushed in order to fit the tight space, then any shred of dignity it still had would get sucked right out during the vacuum sealing process. I guess “imagining” isn’t exactly the right word. “Hoping” would be the better description. 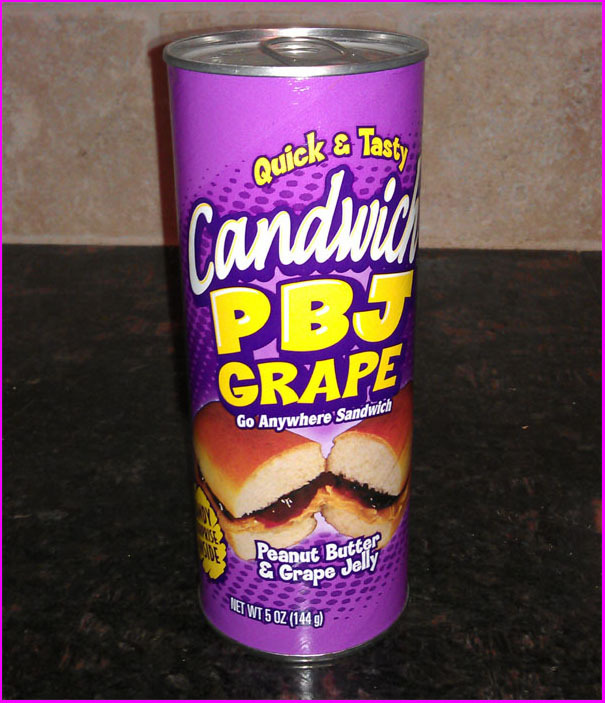 Because really, if you’re going to make a canned sandwich, the last thing you want is something respectable. That takes all the fun out of it. After announcing that they would be releasing a canned sandwich upon the world, Candwich gave us time to let that concept sink in. There was plenty of time for this, because it seemed like it wasn’t for sale for months. Months filled with slowly dragging days, waiting for this gastronomic abomination to be unleashed on the public. When they finally became available to purchase, Candwich decided to offer you two options to purchase them – go to Utah, or buy them in multi-packs online. Driving to Utah seemed like too much of a drastic step to take in order to obtain canned sandwiches, so I opted for the online purchase. The Candwich people are smart, in that you can not order a single Candwich. Since they probably assumed the vast majority of their orders would come from people looking to quench their curiosity over a canned sandwich, the minimum amount you can order is four. So once you’ve had your canned sandwich, you better hope you liked it, because you’ve still got three to go! After placing the order, the cans arrived rather quickly. I didn’t know what they were when they arrived, since I wasn’t actually expecting them to be delivered that fast. The return address said it was from Mark One Foods, which didn’t sound familiar. I assumed it was yet another one of the many food companies who send me free products and samples, in appreciation for all my efforts. Okay, that actually doesn’t happen at all. But that’s fine. After opening the package, the first thing that hit me was that these cans were gigantic. I was expecting something the size of a soda can, maybe smaller than that. Since the two uses they stressed for Candwiches were “on the go” and “emergencies”, I figured they’d be compact and easy to carry. Instead, they come in tubes about the size of a can of Pringles. After opening the first can, I assumed that the reason it came in such a large can was so that the bread wouldn’t get crushed. Which is nice, since the bread was in great condition, but again, the small size novelty is lost. Adding to the “bakery fresh” aura that the bread already had was the fact that it isn’t pre-sliced. Classy! I actually apologize for that obnoxiousness – it is probably better for the bread’s texture to not be pre-sliced. Although that is a guess, my knowledge of how to keep canned bread soft isn’t my area of expertise. The reason I am upset about the lack of pre-slicing is that I managed to cut my finger while slicing the bread. Which I’m sure is more my fault than the Candwich’s. To their credit, the knife it comes with is pretty legitimate. You could probably cut someone’s head off with it, if you had enough time. Although that does make you question the “on the go” use of Candwich. It needs to be more of – “On the go, but make sure you pause your on-the-go-ness when using the knife, or you will most likely sever your index finger”. Speaking of injuries, Candwich’s press materials are somewhat alarming. In multiple places on their site, as well as in their press release, sales sheet, and fact sheet, they constantly reinforce how great a solution Candwich is for emergency situations. Which is convenient, I suppose. I’d rather eat a peanut butter and jelly sandwich than, say, this. But does Mark One Foods know something we don’t about an impending apocalypse? I just can’t help but get a “you might want to stock up on emergency supplies, unfortunately we can’t go into specifics” vibe from their information. In their press release, Mark One Foods describes the Candwich as being similar to an MRE (Meals Ready-to-Eat (I guess MRE was catchier than MR-t-E)). 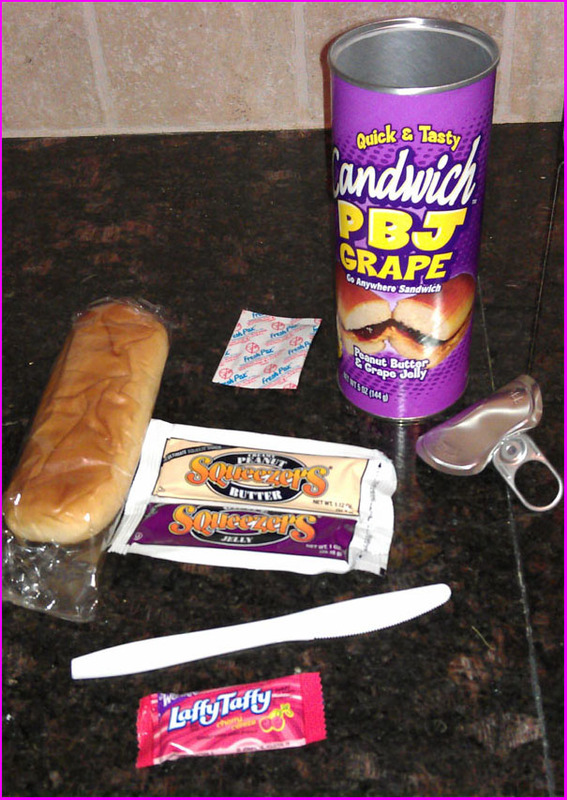 But I will definitely say this for the Candwich – it is a hell of a lot more appealing than an MRE. At least the Candwich still looks like the food that’s listed on the packaging. Back to the matter at hand: preparing the meal which, according to Mark One Foods, is the only thing standing between me and cannibalism in the coming years. After managing to slice the bread relatively cleanly, it was time to dispense the most important part of the sandwich – the peanut butter. The jelly certainly isn’t the most important part, in case you were wondering. Cretin. The peanut butter had a rather unappealing sheen to it, making it sort of look like the bowel movement of a dog who had been eating a lot of crayons. Thankfully, it didn’t taste like that. I mean what I think that would taste like. I’m always slightly disappointed that jelly manufacturers take some pride in their product, which results in that sad, dark shade of purple for their grape jellies. Why can’t it be a bright purple, like the Candwich can? I can’t imagine that anyone would be too offended; in fact I’m sure they’d be delighted by a near-glowing shade of purple. 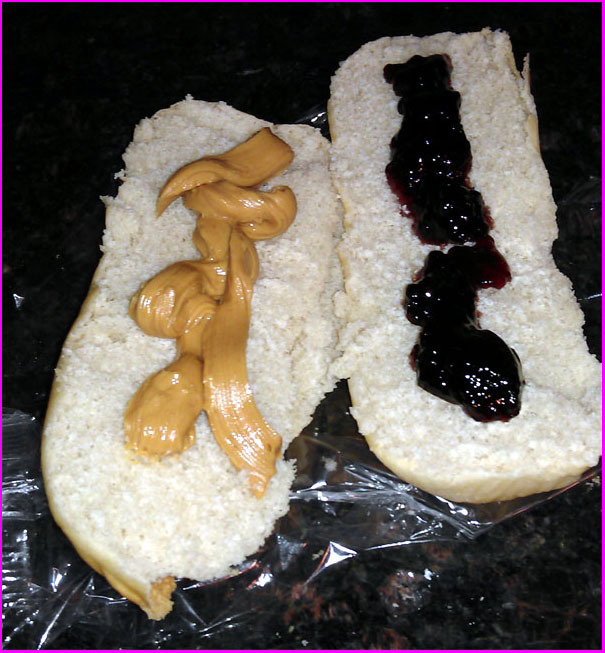 The majority of peanut butter and jelly sandwiches are eaten by children and adults with a wonderfully low set of standards, so everyone who partook in eating the improved jelly would be happy. After being somewhat disappointed that the sandwich didn’t look as disgusting as I had hoped from the “canned sandwich” description, I was even more let down to find out the sandwich was actually good. The bread’s texture was fine, and the surface of it had this sweet glossiness to it. The peanut butter tasted much better than it looked, as did the jelly (especially because it looked so dark and depressing). Once the sandwich was finished, it was time for the snacks. The first snack was a cherry Laffy Taffy. I was a little upset that it was cherry, since cherry Laffy Taffys tend to taste like cough syrup. But at least it wasn’t banana or green apple. Oddly enough, the pre-packaged and sealed Laffy Taffy didn’t fare nearly as well as the sandwich. 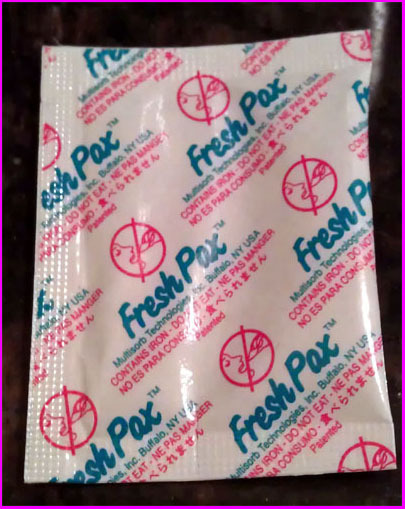 It was all melted, and stuck to the wrapper. Washing my hands after eating it took about three times longer than the actual eating process. I really wouldn’t recommend the other snack. I’m not sure exactly what it’s supposed to taste like, but it was awful. So, the future has arrived. We are eating canned sandwiches and Dippin’ Dots, just as the prophecies predicted. Not Mark One Foods’ prophecies, mind you, as those are filled with predictions of the world dying in a blazing inferno, only to survive to re-build society, stomachs filled with canned sandwiches. Which seems kind of cool, at least. After the nuclear apocalypse, I’d rather eat canned sandwiches than Fancy Lads Snack Cakes.